I have spent much time thinking about my role in Korea and the significance of my work. Having lived in Korea now for almost five years, I realize that a critical issue in one’s success, in every action, is how one is perceived by Koreans, and that how Koreans perceive one it related to how one perceives oneself and one’s role. This rather technical article is based on the research that the Asia Institute conducted together with the Korea Research Institute for Bioscience and Biotechnology in 2008-2009. The Flower of the Dharma Sutra (Fahuajing 法華經) includes a remarkable tale entitled “The Jewel of Great Price” (無價寶珠) that describes quite accurately the state of organic farming in Korea today as a forgotten treasure. This article in the Munhwa Ilbo Newspaper argues that the Korean Wave of today must evolve into the “Korean Dream” of tomorrow. Like the American dream of the 1950s and 1960s, Korea is in the position to influence how people around the world conceive of themselves and their societies by promoting a “Korean Dream,” an model for thinking and behavior. I suggest that Koreans have to take the full responsibility that comes with great influence and put forth a new vision of the world and the role of individuals that will have a positive impact. Such a dream must go beyond consumption to engage with spiritual issues and issues of sustainability. The concept of “Korean Dream’ was first introduced to me by the GPFF (Global Peace Festival Foundation” and I have been much impressed by their efforts to create a new model for activity by youth. There has been quite a lively debate in Korea, and throughout the world, concerning the importance of the humanities. I most certainly think the debate is most welcome and most healthy. I fear that often, however, the argument for the humanities is not made in a manner that will be convincing to undergraduates. 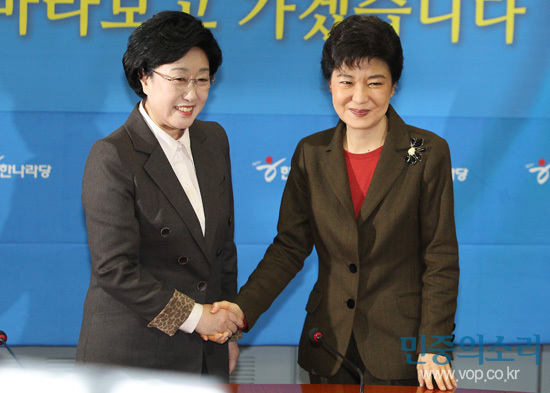 The remarkable emergence of women as the critical political force in Korea is best embodied by the meeting on January 17th, 2012, between Representative Park Geun-hye, chairwoman of the Grand National Party’s emergency committee, and Han Myeong-sook, chairwomen of the Democratic United Party. Needless to say, it is the first time that the leaders of two major Korean parties are both women.